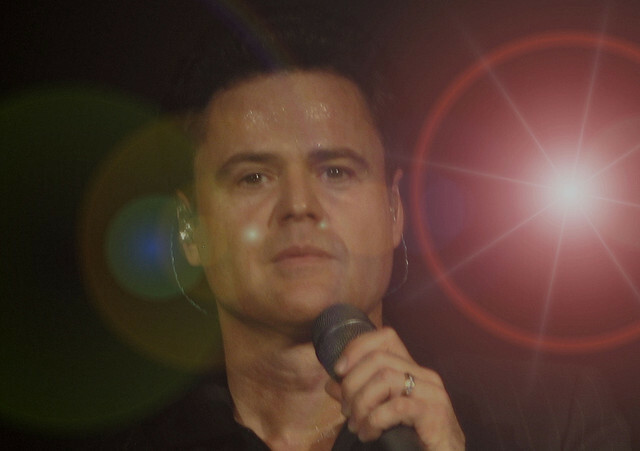 Former teen idol and Dancing with the Stars guest, Donny Osmond has graced the stages of film, television, theater and music for over five decades. He began his career at the age of five performing with his brothers on The Andy Williams Show, before they became famously known as The Osmond Brothers. Donny is also one half of the brother and sister act Donny & Marie. Donald Clark “Donny” Osmond was born December 9, 1957 in Ogden, Utah to parents Olive Osmond and George Osmond. The other members of the family were Alan, Jay, Jimmy Merrill, Wayne, Tom and Virl, and Marie. The Osmond Brothers’ professional career was launched in 1962. Donny’s older brothers Wayne, Alan, Merrill and Jay were discovered by Walt Disney while the family was on vacation. The quartet performed at Disneyland for the summer before landing on the television variety series called The Andy Williams Show. They were regulars on the show for nine years with Donny joining at age five; Initially the group incorporated barbershop style harmonies before moving on to more popular material, the brothers also did intermittent appearances on the Jerry Lewis Show in 1969. The Osmond Brothers recorded their first hit single “One Bad Apple” which spent several weeks at the top of the pop charts in 1971. Several more hits came with “Down by the Lazy River” and “Crazy River” along with Donny’s Billboard Top 100 chart topper “Go Away Little Girl”. Donny’s other solos “Puppy Love”, “Too Young” and “Hey Girl, I Knew You When” brought him international fame. The brothers travelled worldwide performing their hit songs and building an extensive fan base that made them become teen idols. Donny himself graced the covers of Tiger Beat in the early 1970’s (in 2005 he ranked #14 in TV Guide’s list of “TV’s 25 Greatest Teen Idols). Reinventing himself in the early 1980s was challenging for Donny; he had some success when he collaborated with Peter Gabriel and produced “Soldier of Love”, which went to #2 on the US charts followed by “Sacred Emotion”. In the 1990s, he toured as Joseph in “Joseph and the Amazing Technicolor Dream coat”. This lasted to the late 1990s. In 2003 the Osmond Brothers released of a greatest hits collection which made the pop charts in the United Kingdom, shortly followed by a UK tour. That same year, Donny and other members of the Osmond family received a star on Hollywood’s Walk of Fame. In 1974, Donny’s sister, Marie Osmond, joined her brothers and Donny recorded duets with her. The duo had two hits, “Morning Side of the Mountain” and “I’m Leaving It All Up to You” in 1974. Donny and Marie’s exposure on the Emmy award winning “The Mike Douglas Show” led them to their own TV variety show in 1976. The series was aired on ABC from 1976-1979. In 1998, Osmond and his sister co-hosted a daytime talk show Donny and Marie which ran for two seasons. The following year, he added best-selling author to his list of accomplishments with the publication of Life Is Just What You Make It: My Life So Far. An avid Mormon, Donny continues to perform with his sister Marie in Las Vegas. In September 2009 he debuted as a contestant on Dancing with the Stars with partner Kym Johnson. He has a wife Debbie Glenn, whom he married on May 8, 1978. Together the couple has five sons.